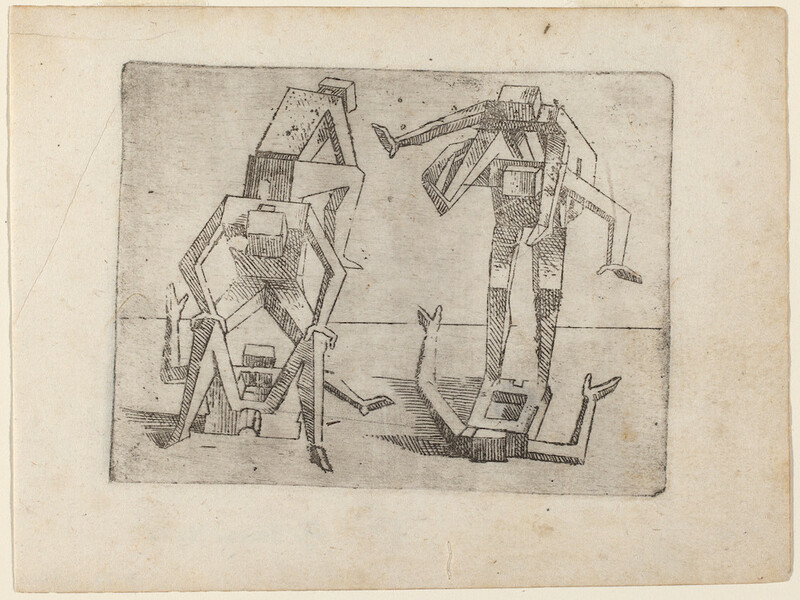 At first glance you may be forgiven for thinking these images to have sprung from some hitherto unknown corner of the Cubist movement, but these remarkably prescient etchings are in fact the creation of an artist working a whole three centuries earlier. 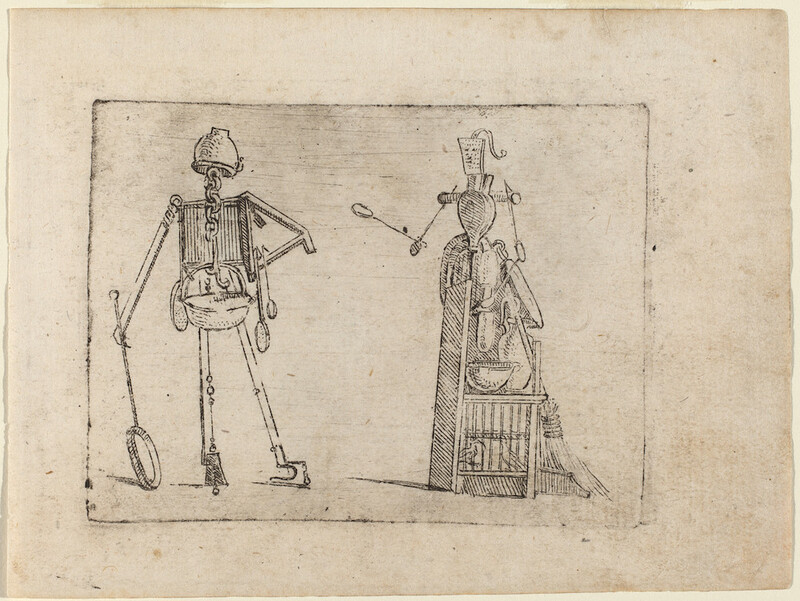 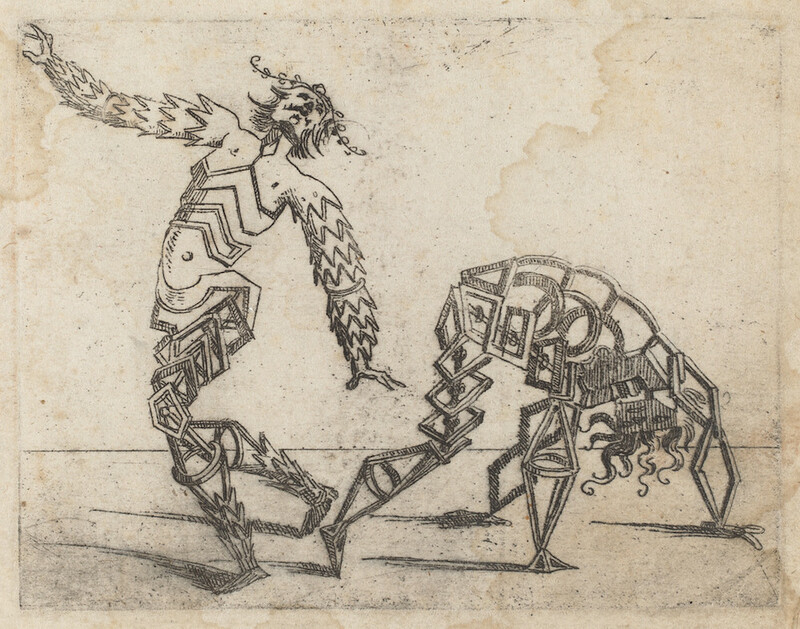 In 1624, Giovanni Battista Bracelli — an Italian engraver and painter working in Florence — produced an extraordinary book of prints titled Bizzarie di Varie Figure (Oddities of various figures). 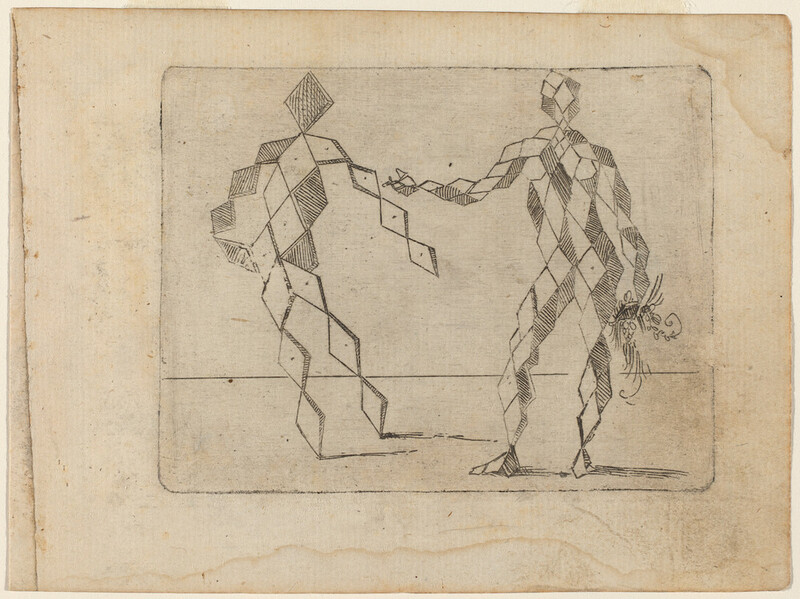 Its forty-seven plates show a variety of human figures mainly interacting in pairs, their bodily forms composed of a range of objects, mostly abstract – cubes, interlocking rings, and squares — but also such things as rackets, screws, braided hair, and the natural forms of trees. 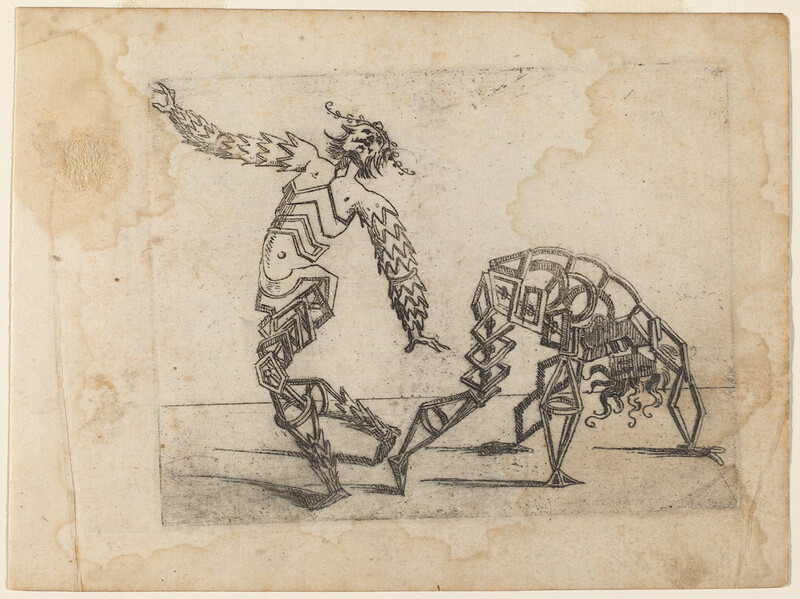 Although the idea of aggregating human forms from other objects was not new — famously explored half a century earlier by fellow Italian Guiseppe Arcimboldo — in their experimentation with abstraction these sketches by Bracelli truly seems to break new ground, prefiguring a certain way of thinking about the human form that would not be explored again for many centuries later. 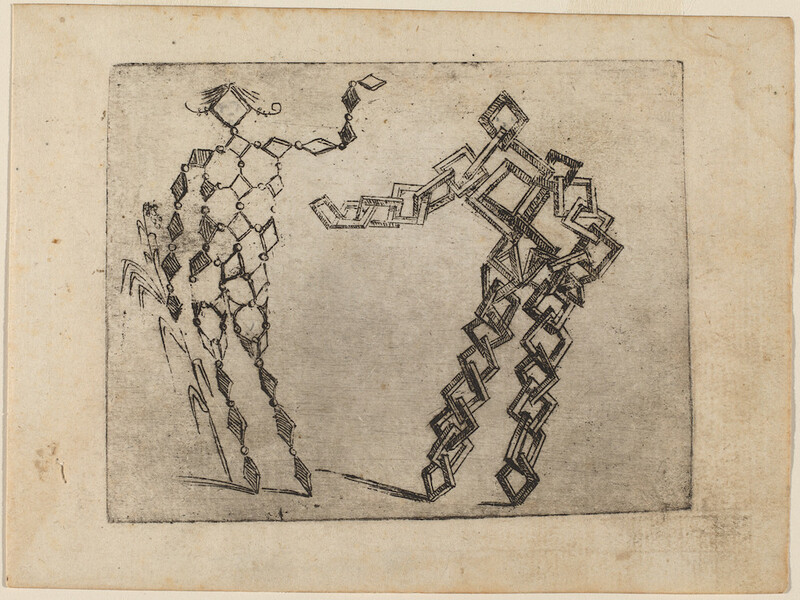 In addition to possible inspiration from Luca Cambiaso’s block figures of the previous century, a major influence on Bracelli appears to have been Jacques Callot’s Balli di Sfessania. 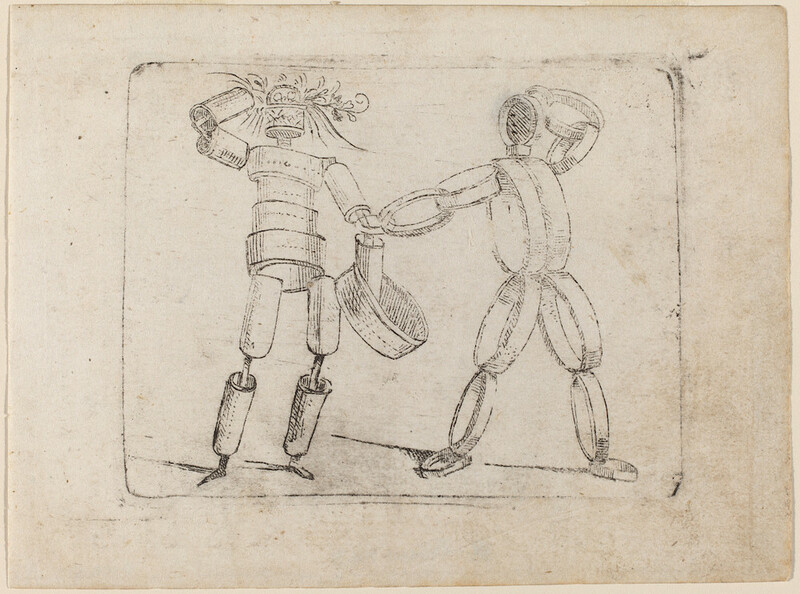 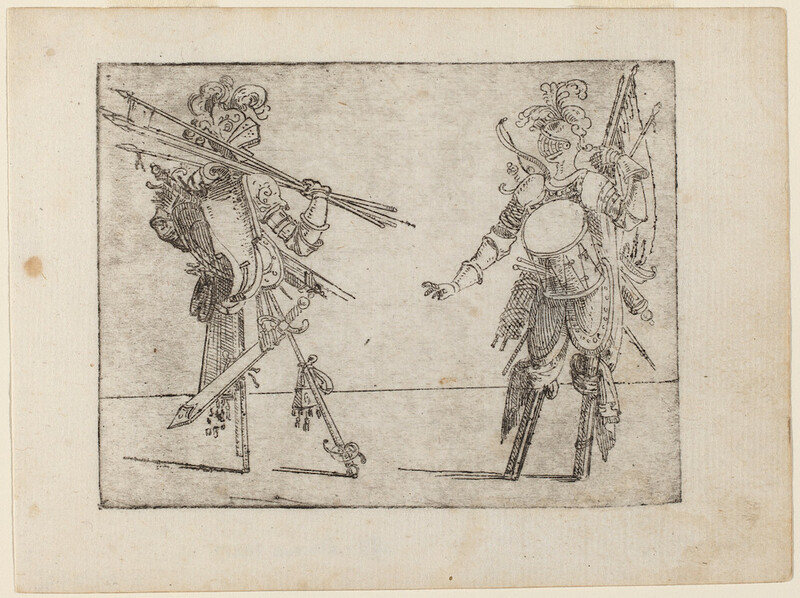 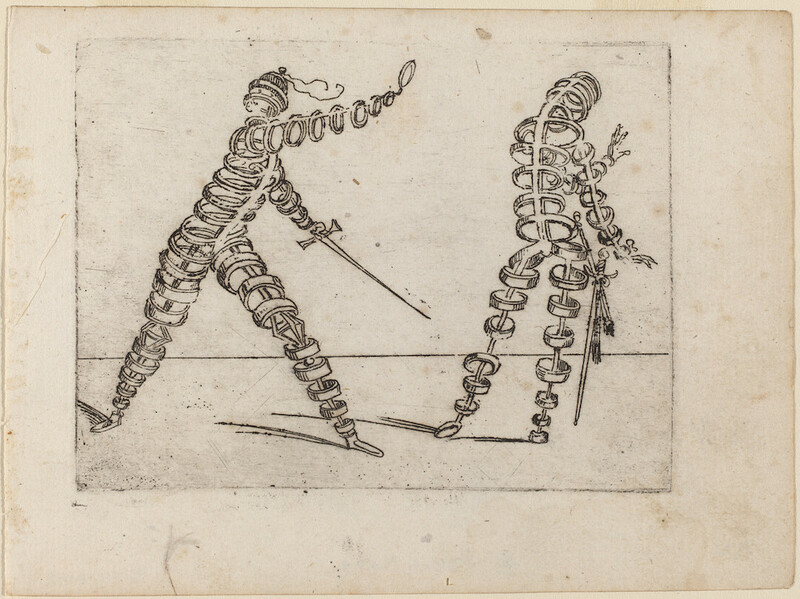 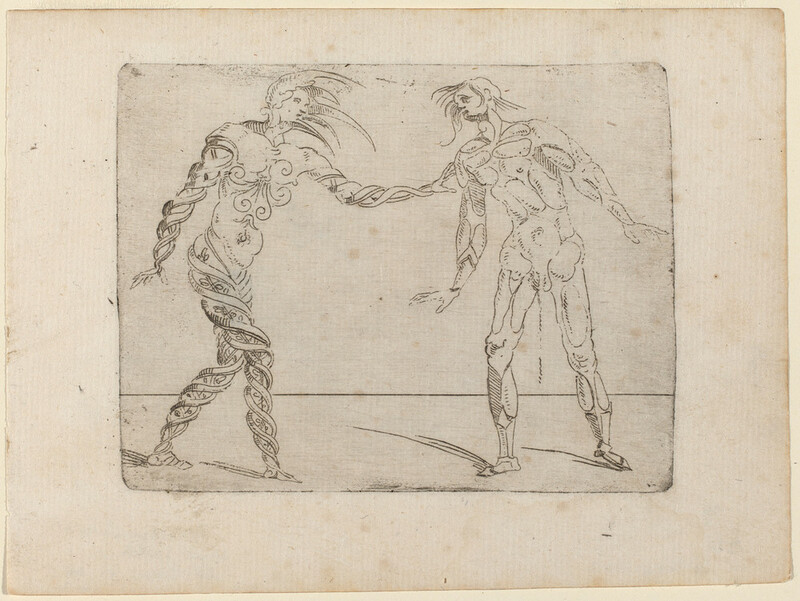 Prepared in Bracelli’s hometown of Florence and published in 1622, Callot’s series of twenty-four etchings each depict a pair of posturing figures which, according to the Encyclopedia Britannica, “was an attempt to document not the commedia dell’arte, as was once thought, but rather a dance of the type generally known as the moresca (symbolizing the conflict between the Moors and the Christians) but known in Naples in its Maltese form as sfessania“. 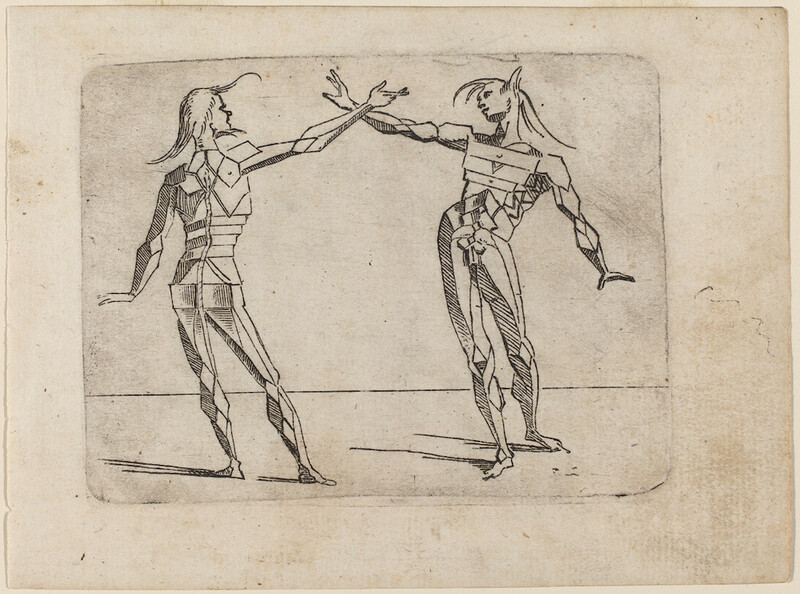 In addition to the formal pairing of figures, Giovanni Battista Bracelli seems to have borrowed something of the performance angle too, but adding to the dancers and duelists with postures reminiscent of tumblers, acrobats, and contortionists. 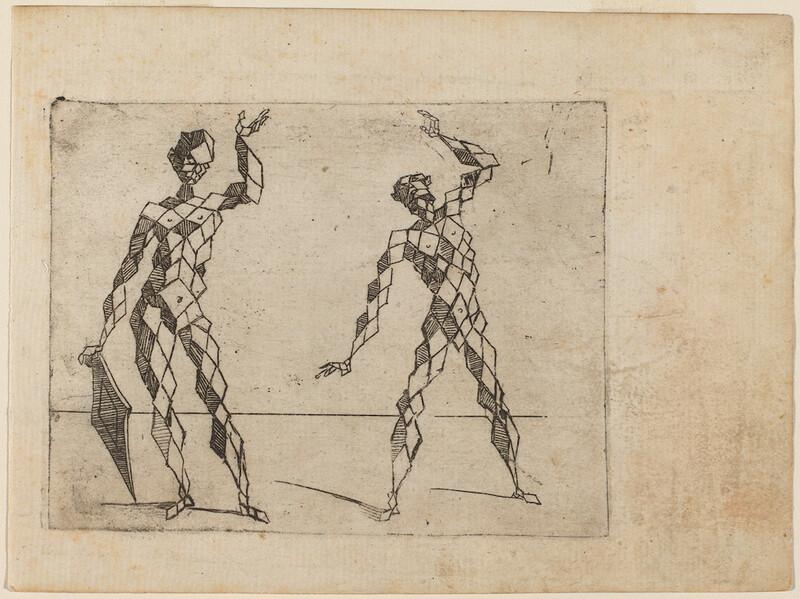 Not a lot is known about Bracelli’s life. 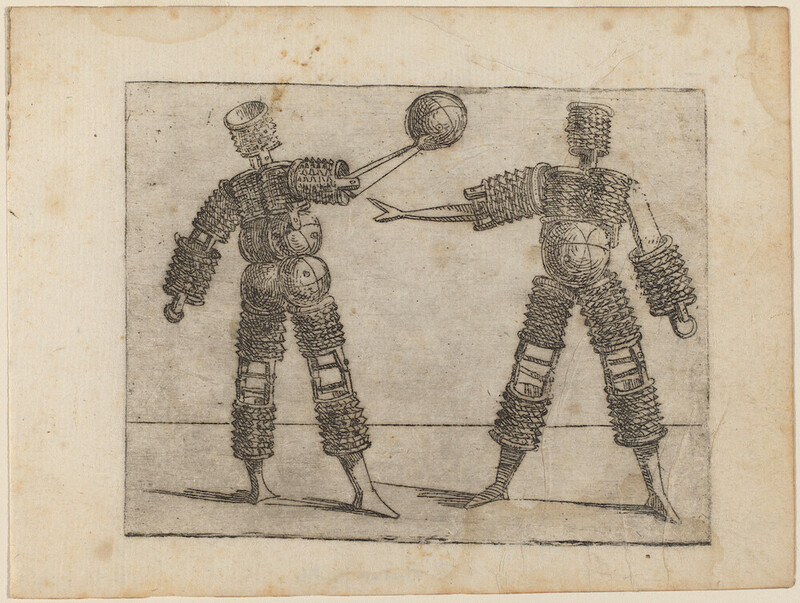 Sometimes going by the name Brazzè, and also the nickname “il Bigio” (“The Gray One”, apparently a reference to his penchant for gray clothes) he is recorded on the membership records of Florence’s Academy of Drawing from 1619 to 1635. 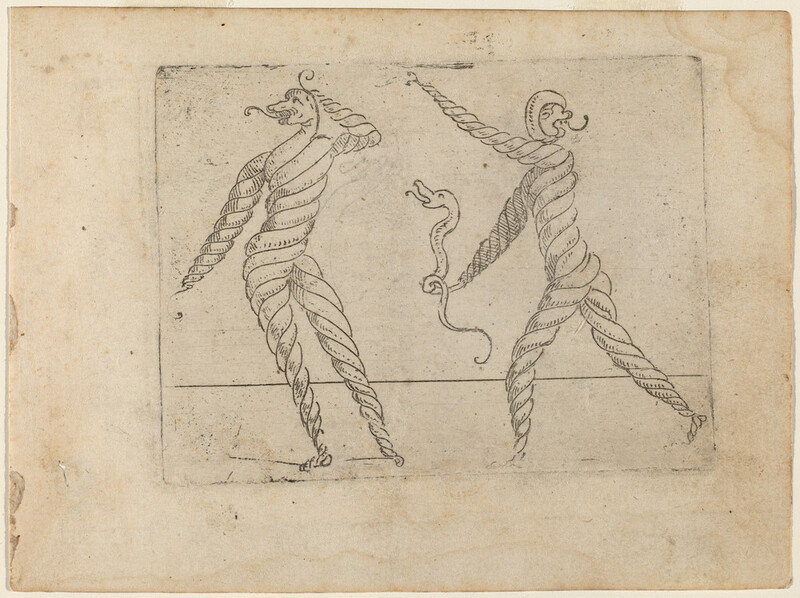 He studied with the painter Jacopo da Empoli (1551–1640), and most of Giovanni Battista Bracelli’s other work is in a similar popular vain to his master’s (nothing like the Bizzarie di Varie Figure) — though he did produce an amusing alphabet composed of human forms. 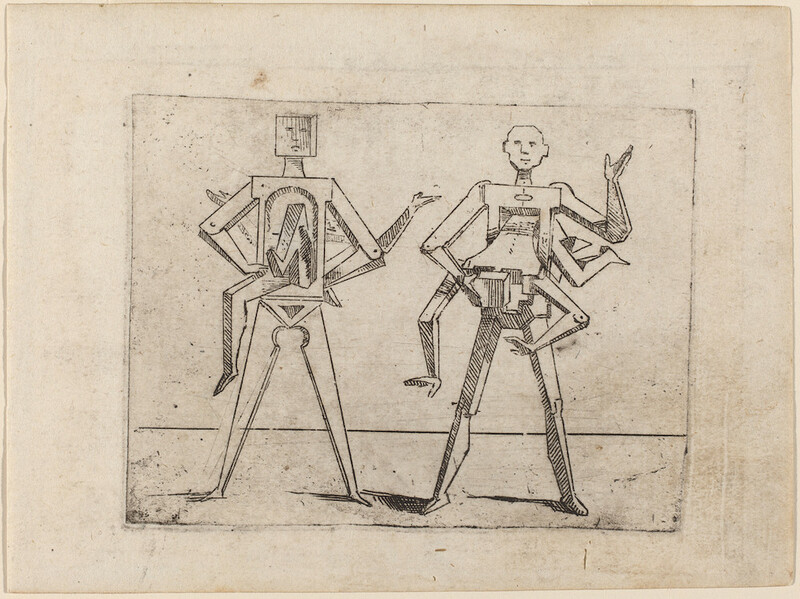 For more info on his life and Bizzarie di Varie Figure we highly recommend this essay by Sue Welsh Reed. 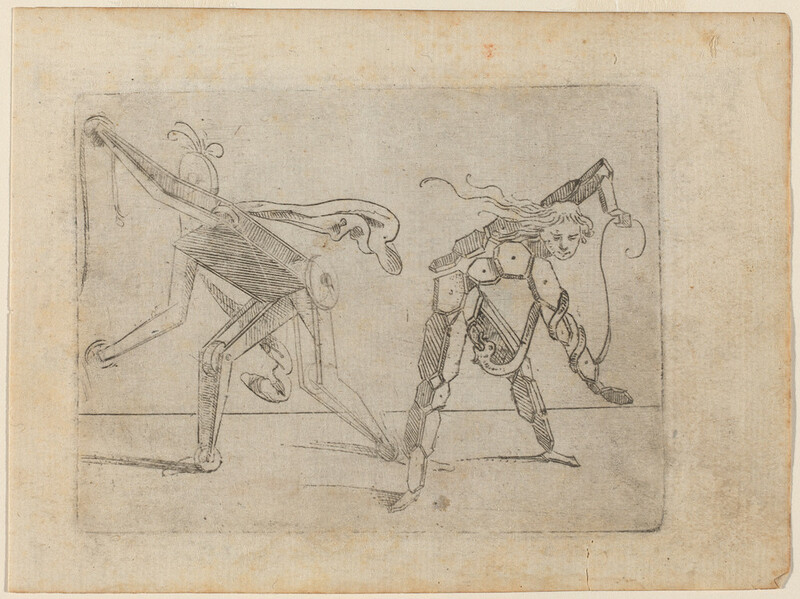 The images featured in this post are from the US National Gallery of Art, and are digitisations of a copy held by the Rosenwald Collection, which you can also see over at the Library of Congress. 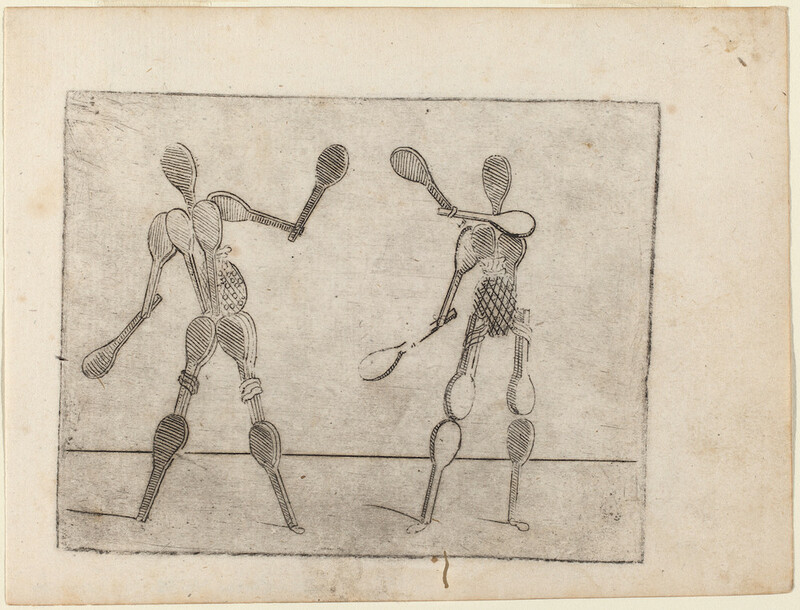 Want some on your wall? 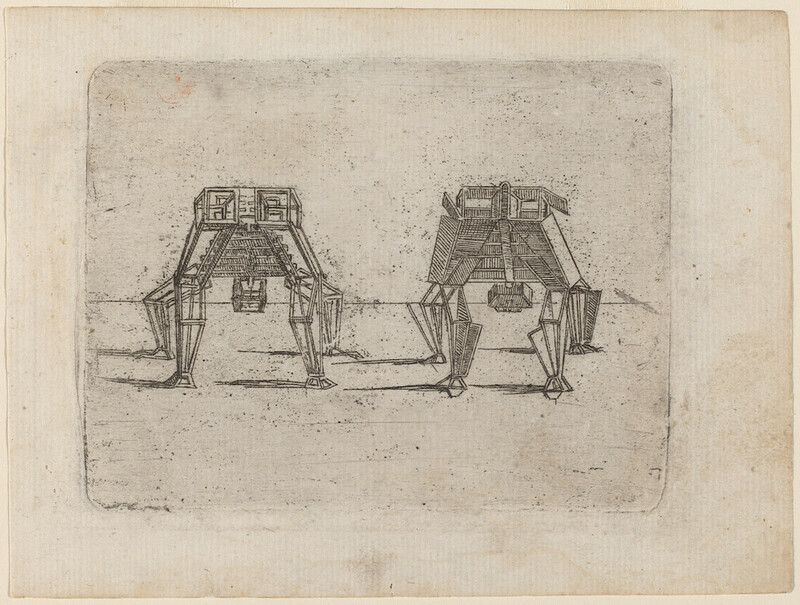 We’ve a selection available to buy as prints in our online shop.